Joia M. Johnson, Hanesbrands Inc.
Elisa D. Garcia C., Office Depot, Inc. In a year that jangled the nerves of the U.S. credit market and saw profits for Fortune 500 companies as a whole fall by almost 20 percent1, women general counsel stayed the course, slightly improving their number of positions at America’s corporate giants. MCCA’s survey of the 2008 Fortune 500 and Fortune 1000 companies reveals2 that in 2008, almost all of the women who made it to the top legal jobs in their companies are still there, and their companies are continuing to prosper. A strong sign of performance and stability for this elite group is the combined profit figure for companies led by top women legal officers. As overall profits declined for the Fortune 500 in 2007 (down 17.8 percent to $645 billion, as compared to $785 billion the prior year3), companies with women general counsel together amassed almost $11.7 billion in profits, up from $10.4 billion in 2007. MCCA’s 2008 research also confirms an increase in the total number of women in the position of general counsel at Fortune 1000 companies, reversing the decline reported last year. In a year that was marked by adversity for America’s largest corporations, women general counsel have risen to the challenge and remained on top. This year, 92 companies in this prestigious ranking have women serving as their top lawyers, two more than in the 2007 survey, and an increase of nine from 2006. Twenty women are new to the Fortune 500 general counsel list, with all but three replacing male counterparts. Frances Jones replaced Patricia Oliver at BB&T Corp., Madeleine Johnson replaced Deborah Ackerman at Southwest Airlines, and Vicki O’Meara replaced Michele Coleman Mayes (who is now at Allstate). Elisa D. Garcia C., who was appointed executive vice president, general counsel, and corporate secretary of Office Depot in July 2007, is only the third Hispanic woman general counsel in the Fortune 500, joining Gloria Santona at McDonald’s and Lisa Iglesias at Nordstrom4. As in 2007, the types of companies that are represented by women general counsel provide some of the greatest diversity on this year’s list. Retail, real estate, and the financial industry had strong showings along with petroleum/refining; furthermore, health care, computers, airlines, utilities, commercial banks, Internet services, and even publishing are represented on the list. The 92 industry leaders on the 2008 list are based throughout the United States; New York, however, heads the list, hosting 14 companies with women general counsel. California comes in second with 11, followed by Texas with eight. Runners-up are New Jersey and Illinois with seven each. This year’s Fortune 500 companies showed mixed growth results: total consolidated revenues were $10.6 trillion, up 7.1 percent from last year, but profits were $645 billion, a decline of 17.8 percent. Energy and financial corporations were among the most successful over the year, but retail giant Wal-Mart Stores, Inc., once again took the number-one position, and MCCA notes that Wal-Mart’s law department is perhaps the most diverse in the nation. As a group, the companies on the Fortune 500 with women general counsel reported total revenues in excess of $1.85 trillion. In the previous report, total revenues for 90 companies in the same category topped $1.49 trillion. And, as noted, profits for the companies listed in 2008 were $11.66 billion, surpassing last year’s figure of $10.4 billion. Although some of last year’s highest-earning corporations with women general counsel posted losses, they stood firm on Fortune® magazine’s most profitable companies list. The great majority of companies with women general counsel had revenues between $5 billion and $25 billion (73 percent). Companies with revenues exceeding $25 billion (18.4 percent) significantly outnumbered those with revenues of less than $5 billion (6.5 percent). In this year’s survey, 46 women serve as general counsel of the highest-grossing Fortune 250 companies—seven more than in 2007. Several women general counsel who left Fortune 500 companies were replaced by men or had men take over what had been acting general counsel roles (Washington Mutual, General Mills, Assurant, CarMax, CMS Energy, Blockbuster, Boise Cascade Holdings, Shell Oil Company, BorgWarner, and H&R Block). Women moved off of this year’s list for varying reasons. Fay Chapman of Washington Mutual, Joanne Bober of J.C. Penney, Siri Marshall of General Mills, Deborah Ackerman of Southwest Airlines, and Cathy Lamboley of Shell all retired. J.C. Penney had no acting general counsel at the time of publication. Four general counsel on last year’s list—Angela Braly of Wellpoint, Michelle Goolsby of Dean Foods, Michelle Halasz of CarMax, and Laurene Horiszny of BorgWarne—went on to accept new positions outside of the law department in their companies. Other general counsel cited personal reasons for leaving; for some, no information was available regarding why they left. Fifteen women general counsels’ companies fell off the Fortune 1000 list in 2008. The number of women general counsel at companies ranked in the Fortune 501–1000 (“Fortune 1000”) increased in 2008 after a decline in 2007. Seventy-eight women general counsel comprise this year’s group, an increase of eight from the 70 reported last year. Twenty new names appeared on this portion of the survey, with three women being replaced by other women. In light of the fact that profits were able to grow in a year of overall decline, it can only be assumed that the newcomers performed well. The new general counsel reached the Fortune 1000 list in different ways5. Ten women were promoted in-house after having served at their respective companies for a number of years, and another four moved laterally from general counsel or associate general counsel positions at other companies. Three new general counsel were already in the top legal job when their companies moved to the Fortune 1000 list in 2008. No specific industries dominated this year’s list, although gas and electric utility companies, food and food services companies, and specialty retailers figure prominently. Rather, the list reflects a range of businesses spanning health care, computers, chemicals, insurance, building materials, securities, and others. Of the four publishers who appeared on the 2007 list, one—R.R. Donnelly & Sons—broke through to the Fortune 500 in 2008, while three remain in the Fortune 1000. Scholastic, publisher of the wildly successful Harry Potter series, fell from the 790 position in 2007 to 841 in 2008. 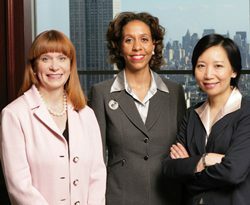 Fortune 1000 women general counsel work in companies throughout the United States. This year, California tops the list with nine, followed by New York with eight, Ohio with seven, and Texas and New Jersey, each with five. Two women general counsel work for Fortune 1000 companies based in Hawaii and Puerto Rico. In a reversal from the 2007 survey, the Fortune 1000 group presents a smaller picture of diversity than does the Fortune 500, with two Hispanic, three African American, and one Asian American women general counsel. Race/ethnicity percentages for the 2008 list are as follows: 92.3 percent white/Caucasian (non-Hispanic), 3.8 percent African American, 1.2 percent Asian Pacific American, and 2.5 percent Hispanic. One general counsel declined to disclose her race/ethnicity. This year’s survey revealed that 15 women have dropped off the Fortune 1000 list since last year’s ranking. Seven of those are not listed simply because their companies did not make the top 1,000 cut this year: EGL, Laidlaw International, Reader’s Digest Association, Dura Automotive Systems, WCI Communities, Ohio Casualty, and Palm. But the women still hold the general counsel spot. Five departing women general counsel were replaced by men, as opposed to last year’s rate of three. Two women replaced by women were Linda Auwers, who retired from ABM Industries and was replaced by Sara Halavinka McConnell; and Jackie Mahi Erickson at Hawaiian Electric Industries, who was replaced by Susan Li. The findings from MCCA’s 2008 survey of women general counsel reveal trends that, taken together, should continue to strongly encourage women in house counsel. 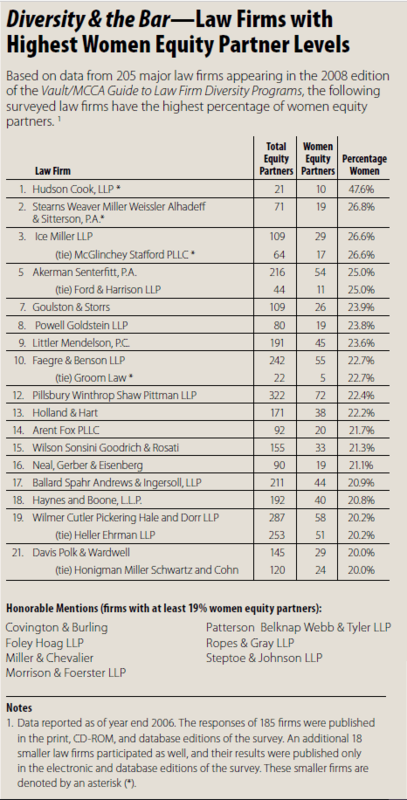 Top corporate women lawyers maintained their number of positions on the exclusive top 500 list, demonstrating perhaps that in one of the most recent uncertain economies for corporate America, women general counsel guided their corporations through myriad legal and business challenges. And even though the Fortune 1000 group did lose five women lawyers to male replacements, the gains in the past two years are far from being wiped out. Women general counsel continue to be based in locations throughout the continental United States as well as Hawaii and Puerto Rico, and demonstrate expertise in a variety of industries. One of the most stunning aspects of this year’s survey is the increased profit that the companies on the women general counsel list earned in the face of a staggering 20-percent decline for the overall list. Of note is that several new women on this year’s list rose dramatically with their company’s fortunes. Beth Wilkinson of Fannie Mae saw her company break onto the Fortune 500 list for the first time at position 53. Kathleen Pelligrino joined Humana as it rose to 98 from 110. Oracle jumped from 167 to 137 with Dorian Daley at the legal helm, and also landed on Fortune® magazine’s most profitable companies list. Debra Kuper rose with AGCO from position 421 to 359. The new general counsel at Embarq, Claudia Toussaint, arrived with her company at position 381, having never been on the list before. Avery Dennison leapt 30 positions to 382 with its new general counsel, Susan Miller. Mary Ann Jorgenson rose with Hexion Specialty Chemicals from 433 to 422, and Denise McWatters saw Holly go from 518 to 484. Here is a brief look at a few of the companies where the very top corporate women general counsel have expertly combined their legal and business acumen— and the year’s work they have faced. Kim Bowers, general counsel of independent oil refiner Valero Energy since 2006, continued to guide the company, which now owns more than 5,000 gas stations and has been one of the fastest-growing companies in the United States in recent years. In addition to appearing as one of Fortune’s most profitable companies, Valero gained a spot on Fortune’s Blue Ribbon list by virtue of being on six other lists: Fortune 500, Global 500, Global Most Admired Companies, 100 Best Companies to Work For, and 100 Fastest-Growing Companies.10 Last year, Valero, one of the largest refiners in North America, moved up 271 positions from its 287 ranking in 1997 to position 16 on the 2007 Fortune 500 list. In 2008, it maintained the 16th position. This stunning ten-year growth for the Texas-based company and its ability to maintain profitability in a rough year for corporations perhaps can be attributed in part to Bowers’s contributions to the company. She joined Valero in 1997, and has climbed in her position as the company has in its. In fact, Bowers was appointed general counsel in 2006 after working as lead attorney for all of the company’s major acquisitions during her tenure. See Geoff Colvin, “Why the Party’s Over,” Fortune, May 5, 2008. The term “Fortune 1000” refers to companies ranked among Fortune’s 501 to 1000 companies. See Colvin, supra note 1; see also “Wal-Mart Unseats Exxon Mobil for Top Spot on Fortune 500 List; Ranks No. 1 for Fifth Time in Six Years,” Apr. 16, 2007, at www.timeinc.net/fortune/ information/presscenter/fortune/press_releases/20070416_f500.html. As we went to press, MCCA learned that Ms. Iglesias was no longer associated with Nordstrom as of mid-June 2008. She is counted as general counsel in this year’s survey because she served in that role through 2007, which is the baseline year for determination of this year’s Fortune 500 companies. MCCA could not confirm the career path for three of the new arrivals on the Fortune 1000 list through published sources. See “Fortune 500 2008: Top Performers— Most Profitable Companies: Profits” at money.cnn.com/magazines/fortune/fortune500/2008/performers/companies/profits/. See Conor Dougherty, “Deborah Siegel, General Counsel, Guess, Inc.,” in Who’s Who in Law, Los Angeles Business Journal, March 3, 2003, at http://findarticles.com/p/articles/mi_m5072/is_9_25/ai_98945800/ pg_5. “Fortune 500 2008: ConocoPhillips— COP,” at money.cnn.com/magazines/ fortune/fortune500/2008/snapshots/327.html. “Fortune 500 2008: Goldman Sachs Group – GS,” at money.cnn.com/magazines/fortune/fortune500/2008/snapshots/10777.html. “Blue-Ribbon Companies—Valero Energy (10),” at money.cnn.com/galleries/2007/fortune/0712/gallery.blueribbon.fortune/10.html. MCCA thanks freelance writer Rachel Ray for all of her work in the preparation of the article, analysis of the survey results, and related research; Vicki Richardson, Esq., for completing the extensive and time-consuming survey of 1,000 companies to compile data on race/ethnicity and gender of the general counsel; and Patrick Folliard for authoring the profiles of the three minority general counsel featured in this article.